April Cottage01263 715779work01603 870304fax Self-cateringThis delightful holiday home has modern utilities and is tastefully decorated to provide a relaxing and comfortable stay. Situated in the heart of a collection of beautiful Broadland villages, the surrounding area enjoys a great variety of cycle routes, paths to walk and nature reserves to explore. 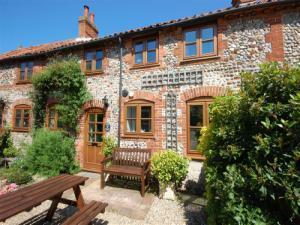 April Cottage is a pretty brick and flint terraced cottage. This delightful holiday home has modern utilities and is tastefully decorated to provide a relaxing and comfortable stay. Situated in the heart of a collection of beautiful Broadland villages, the surrounding area enjoys a great variety of cycle routes, paths to walk and nature reserves to explore.